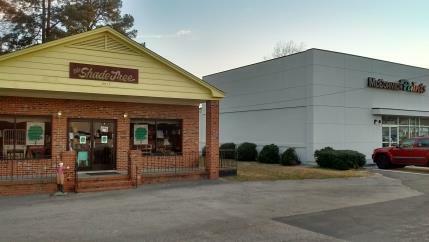 THE SHADE TREE IS LOCATED ON THE WEST BOUND LANE OF WESTERN BLVD. WESTERN BLVD. IS ONE-WAY IN FRONT OF OUR STORE. WE LOOK FORWARD TO SERVING YOU AT THE SHADE TREE. FROM RALEIGH- TAKE EXIT 2B OFF I-440. IT IS CALLED THE CARY EXIT. PASS THRU THREE LIGHTS. THEN JUST AFTER THE THIRD LIGHT MOVE INTO THE FAR LEFT LANE AS IT BEGINS. TURN LEFT INTO THE FIRST DIRVEWAY AND WE ARE THE FIRST BUILDING ON THE LEFT. WE ARE ON THE LEFT BESIDE THE NEW WHITE BUILDING (OLD FRED'S BEDS). OUR BUILDING IS ACROSS THE STREET FROM THE XL SOCCER WORLD. FROM CARY- FROM CARY- COME OUT CHATHAM ST., CROSS MAYNARD PASSING COOPERS FURNITURE ON THE RIGHT. IN ABOUT 2 MILES YOU COME TO A LIGHT( JONES FRANKLIN RD. ) AFTER THE LIGHT GET IN THE LEFT LANE AND GO TO THE NEXT LIGHT ( HILLSBORO ST ) IN THE LEFT TURN LANE. NOW YOU ARE ON WESTERN BLVD. OUR BUILDING IS THE FIRST ON THE LEFT AFTER THE U-TURN ON WESTERN BLVD. THE LEFT LANE TURNS IN RIGHT IN FRONT OF THE SHADE TREE. Please call 919-859-1923 let up set up an appointment to select your special shade. For lamp repair you can just stop by but better call first to be sure we are at the store. Thank YOU !! Jane & Bruce The Shade Tree.